Preceden's Teams feature allows a group of people to create and work together on each other's timelines. On certain work plans, you'll have the ability to choose a team size when purchasing the Premium plan. If you pay for just 1 user, your plan will act like any other individual-user account. If you pay for multiple users, you will become a Team Lead in Preceden and be able to invite other people to join. Those people will also be on the Premium plan and they'll be able to see and edit every other team member's timelines, including yours, and vice versa. 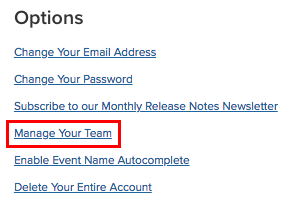 In the future you can get to that page by clicking on Account in the top navigation bar and selecting Account Settings. How do teams and collaboration differ? We have a guide on that: Teams and Collaboration. What type of accounts can use teams? Work accounts, meaning that when you signed up for an account you specified you are using it for work. 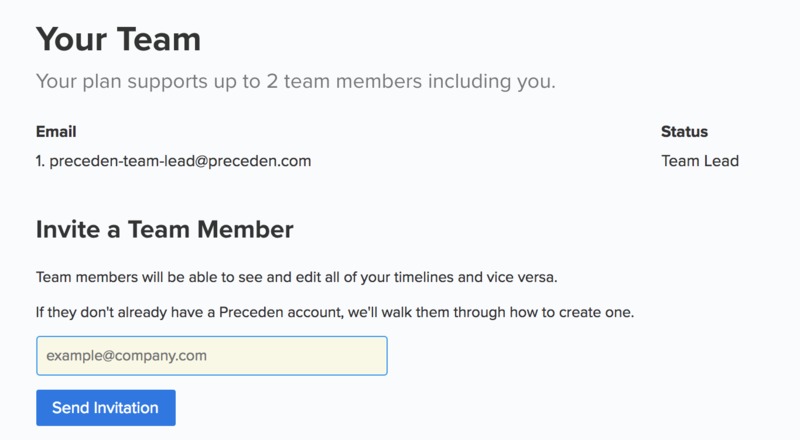 If you signed up for another type of account, for example, Personal Use, and want access to teams, contact us at help@preceden.com and we'll adjust your account. Also, some older work accounts don't have plans enabled yet. If you don't see an option to upgrade to expand your team size, contact us and we'll make the necessary adjustments: help@preceden.com. How much does it cost to invite team members? $50 per additional user per year. For example, if the Premium plan costs $149 per year (for 1 user) and you want to have a team of 3 (including you), it would be $249. Renewal for all users on an account will occur when the account holder renews the account regardless of when the last user was added. For example, if the account holder's account will expire December 1, 2019 and they added a user on April 3, 2018, they still need to renew their account, plus $50 per user on December 1, 2019. Can I expand my team size later? Yes, you'll have the ability to upgrade to expand your team size if you wish. For example, if you sign up for 1 user for $149, then decide you want to expand it to 3, you'll have the ability to pay just $100 more to upgrade to a team size of 3. Is there a way to hide a timeline from other people on a team? No, everyone on the team can see and work on each other's timelines. If you're interested in this though, please contact us. It may be something we can add in the future: help@preceden.com. How many timelines can we create while on a team? The features of the Premium plan - unlimited events, 10 timelines, etc - apply to each person on the team. For example, a 3 person team could have 30 timelines max, 10 for each person on the team. What if I need more than 5 people on a team?